Congratulations to Professor Richard Cole who has been awarded a Fulbright Specialist position this summer at Griffith University in Nathan Queensland, Australia! The third annual Dillon Symposium, organized by the David Dillon Center for Texas Architecture, will be Oct 10-11 in Dallas. An interdisciplinary group of speakers from architecture, urban affairs, history, social work, policy and policing will examine the topic of “Building the Just City” — ways that we can construct spaces, in our streets and in our prisons, that better reflect our ideals of justice, fairness, and decency. SUPA Associate Professor Colleen Casey will be one of the speakers at the panel “What is a Just City” on Oct 11. See program details and register for the symposium. Master of Arts in Urban Affairs student Tharani Devi Krishnakumar’s summer internship with Greenpeace at its Washington D.C. headquarters was featured on the Green Source DFW blog. Krishnakumar’s internship was made possible by the Archer Fellowship Program, which sends University of Texas System students to Washington D.C. for internships. Urban Planning and Public Policy doctoral student Reza Sardari had an internship this summer with C&M Associates in Florida, which provided opportunities for hands-on application of knowledge gained from his classes and his work as a Graduate Research Assistant at the Institute of Urban Studies. His internship position as Associate Transportation System Modeler consisted of assisting with travel demand modeling and transportation planning, working on traffic data processing, and reporting the results of traffic modeling. “Working as a graduate research assistant at the Institute of Urban Studies was a great opportunity for me to be involved in different projects such as land use planning, parks and recreation master planning, economic development and transportation planning,” he said. Sardari noted that highlights of the internship included learning Cube software, a travel forecasting and transportation GIS system, as well as working with the Florida Standard Urban Transportation Model Structure (FSUTMS), that includes software, data formats and operating procedures for travel modeling. In a unanimous vote of the Urban Affairs Association (UAA) Governing Board, Dr. Richard Cole was inducted as a member of the UAA Service Honor Roll. Cole, along with other honorees, will be recognized at the UAA conference to be held in San Francisco this April. To learn more about the association, visit the UAA website. Congratulations SUPA Class of 2012! Members of the School of Urban and Public Affairs Class of 2012 received their degrees at SUPA’s commencement ceremony on May 12, 2012, at UTA’s new College Park Center. 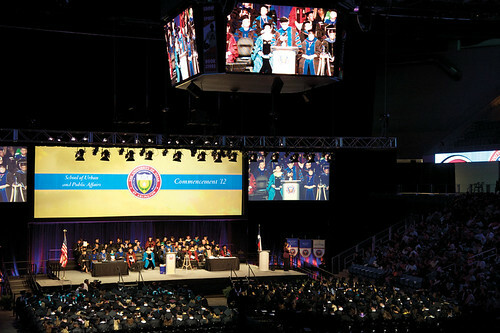 UT Arlington President James D. Spaniolo gave the commencement address. Posted on May 14, 2012 May 16, 2012 Categories City and Regional Planning, Interdisciplinary Studies, Public Administration, Students, Urban AffairsTags alumni, Arlington, college park center, commencement, graduation, SUPA, UTALeave a comment on Congratulations SUPA Class of 2012!